Giveaway ends February 26, 2019. What is The Social Way about? Do you struggle to meet new people and make new friends? Do you find socialising difficult or even terrifying? Do you imagine how life might be different if you were surrounded with friends? Do you wish the world was a friendlier place? If you answered yes to any of these questions, this is the book for you. 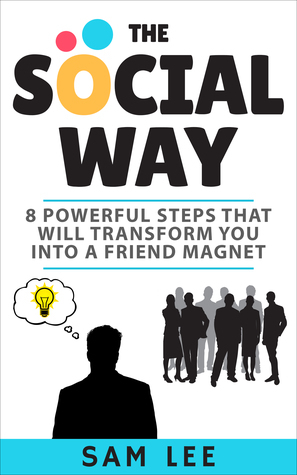 No matter what your social challenges, The Social Way and its simple eight-step process will equip you with all the resources you need to turn you into a friend magnet. You’ll learn how to introduce yourself confidently and winningly and how to converse naturally and neutrally. You’ll soon be able to break the ice with almost anybody and keep them talking and, with a little help from the chapter on humour, you’ll have them laughing as well. You’ll learn where to go to find the deepest social pools and how to fish in them. You’ll learn how to turn new acquaintances into friends and then how to turn those friends into best friends. With each new acquaintance and each new friend, you’ll be making the world a friendlier place one connection at a time, and that, my friend, is what the Social Way is all about. What others are saying already about this book..
“It’s the sort of book we can recommend to our customers. They would get a lot of value from it when scheduling their book launches, in-person and networking events.” – Noel from BookCoverCafe. “Thoroughly engaging and thought-provoking!”…. Jessica S, Sydney. “The Social Way, this book is a great confidence booster! Sam has covered many important topics such as first impression, body language, setting boundaries to social etiquette that we can all learn from. I read his book front to back, best part is it is easy to read and understand without all the jargon” …. Heidi Yi [Author]. “The Social Way is the book that teaches us how to be social able. In this book, Sam gives us great advice, on how to behave in the Social Circle, to help one improve on oneself for a better way of life. Sam writes with passion and clarity, which makes easy for anyone to read. It is filled with lots of case studies that makes the e-book interesting to read. This is a lovely social book that I know you will enjoy.” ….Rosa Kourtidis. So if you are ready to improve yourself and become a friend magnet, click on the link below.